When we got our first servers, someone suggested to name them after the members of the famous crime family — the Corleones. 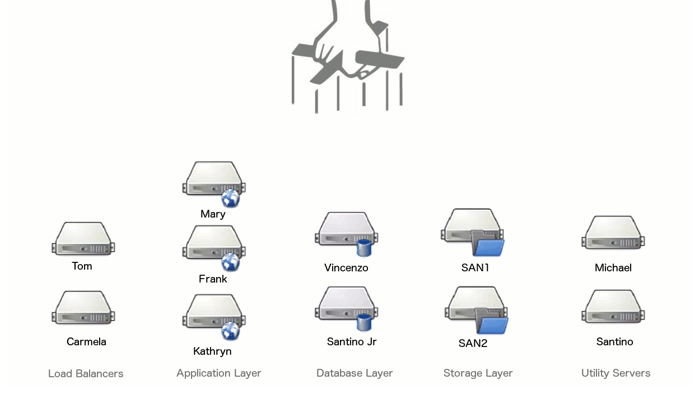 Every time we got a new server, we used the “Godfather” naming convention and slowly expanded The Family. At first, it was a perfect match. Our servers were like the legendary family — they meant business, each had a personality and their own responsibilities. Also, no one could mess with them, they made offers you couldn’t refuse, kept all the logs in the family and sent hackers to sleep with the fishes. The first two members were Vito and Michael, although Vito retired later. As the family grew, we installed Puppet on Michael and he was in charge of keeping others in line. There was also the funny moment when Vincenzo was down. But in the end, it’s not something we'd recommend. Firstly, no one knew what each family member did. Only the system admin knew while others had to look it up. The second (bigger) problem was — we ran out of family members. When you think of the Corleones, you’d think it was a pretty big family, but they’re really not; at least for our server family, which grew quickly. When we ran out of names, we started to use proper names for new servers. Storage servers were named SAN1 and SAN2, load balancers LB1 and LB2… By now all the servers are properly named and it’s easier to distinguish them. So don’t get creative with your servers. Don’t name them by the planets, X-Men, members of Starks and Lannisters, or anything similar. Sure, it’s soulful and makes a good source for inside jokes, but it can cause confusion. Name them by what they actually do — your DevOps will be grateful.